Inflatable robotic sculptures are remotely deployed at various spatial and geopolitical borders to create a soft archway, a peaceful metaphor for the desire for more connection. Borders can appear hard and fixed on maps, in language, and in space. But these borders are constructed and ultimately malleable. 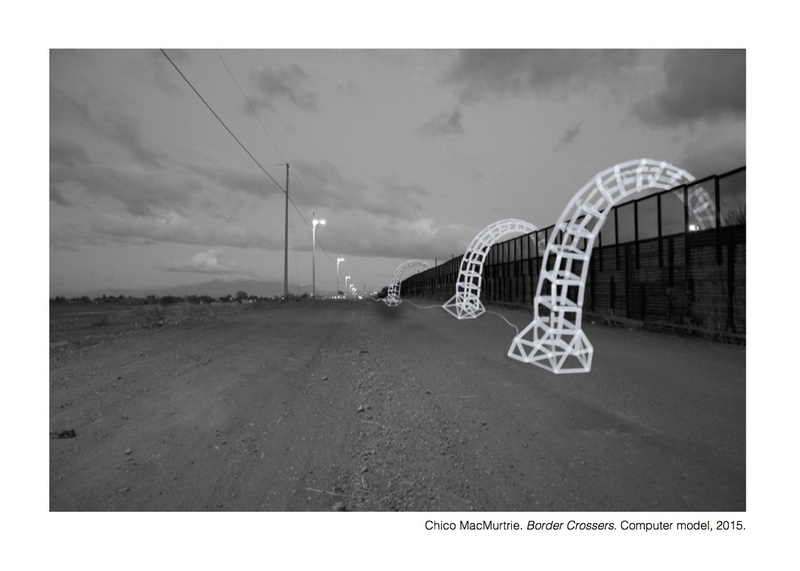 Border Crossers comprise a series of lightweight robotic sculptures that peotically explore and question the notion of borders and boundary conditions. The inflatable sculptures, working in tandem, rise up to several stories high and extend, giraffe-like, across a given threshold. Their choreographed performance, originating on both sides of the border, would stage a symbolic connection. Border Crossers provoke investigation of borders as constructed entities. At one level their actions embody a simple curiosity to see what lies on the other side of a border (national, architectural, environmental, etc.). On another level, the work expresses a utopian desire to live in a world without borders. The project treats the border as a physical condition that can be temporarily transcended by technological proxies. It offers a critique of militarized geopolitical borders, and a metaphorical suspension of those borders in the form of temporary arches or partial arches equipped with sensing and surveillance technology.